18th to 23rd AUGUST 2019. Please make your own bookings but let Jim know (5446 8562). Arrive and set up camp with possible afternoon paddle—possibly Lake Kurwongbah. Paddle Pine River u/s from Deepwater Bend. From Dohles Rock B/R to Redcliffe and return. From Shorncliffe B/R u/s on Cabbage Tree Ck / Nundah Creek. Brisbane River from Pinkenba B/R. RECIPES – Includes Margaret’s Tasmanian Requests. Distance 9.5km across to our campsite on Peel Island. Being outside of school holidays and midweek we should have the place to ourselves. Leave from Masthead Drive, Raby Bay on 17 June and set up camp. Short paddle in afternoon. Be ready to leave at 10am on the water at Masthead Drive. For those travelling from the Sunny Coast plan to be there by 8.45 allowing a bit over an hour to pack the boats with camping gear and get them down to the beach. Make sure you bring your kayak trolley for the 100m walk down to the water. Trolley will then be returned to car. You will need to bring sufficient water and food for your 3 night stay. The launch place at Masthead Drive is next to a park fronting the water. It has plenty of parking bays on one side and houses on the other. I have camped many times on Peel and always left the cars there without any issues. Potential paddles depending on weather conditions. Please make your own bookings on Queensland National Parks website below. Cost campsite fees $6.55 per night. If you don’t have an account you need to create one. Click on CAMPING and then follow the prompts to book. When booking the name of the island is TEERK ROO RA and the name of the campsite is HORSESHOE BAY. We will be camping within a short walking distance of the toilet on Horseshoe Bay. Please let me know if you plan to attend the camp. Anyone having trouble with the booking website, let me know and i can lead you through it. 7th to 15th November 2019. This Camp will be held at two locations over the week. The first paddles will be at Myall Lakes followed by a relocation to Port Stephens for the remainder. There will be 3 paddles from each site with more details to follow. Myall Lakes – 7th to 11th. Accomodation will be at the NRMA Myall Shores Holiday Park. Access is via a well-maintained dirt road from Bulahdelah on the Pacific Highway. Port Stephens – 11th to 15th. Two of the paddles will be from Little Beach, so powered sites and Villas on the Little Beach side of the park would be preferred. It is recommended to book early as the Halifax holiday park will book out. WHEN – Sunday 19th May – Saturday 25th May. ACCOMODATION – It is recommended to book early. Two accomodation sites are recommended. The “Official” site in the Town Centre and the “Unofficial” site at Carlo point where most of the paddles will depart. The Official Camp Accommodation will be the Rainbow Beach Holiday Village right in Rainbow Beach. The Unofficial Accommodation will be the Rainbow Beach Holiday Park at Carlo Point. This is where most of the paddles will depart from. This is an open water (Class 2) trip. It is weather dependant and will be scheduled accordingly. Arrive at Rainbow Beach. Accommodation at Rainbow Beach Holiday Village or Rainbow Beach Holiday Park. Happy hours will be at Rainbow Beach Holiday Village. High Tide 1002 hrs – Carlo Point to Poverty Point (24K) – This is the longest paddle and we would get good incoming tide and supportive outgoing tide for home run. High Tide 1042 hrs – Carlo Point up Snapper Creek (17k) – We would have an incoming tide for outward paddle, and would be paddling against the tide for a bit of the home run, but should be fairly slow flowing by then. 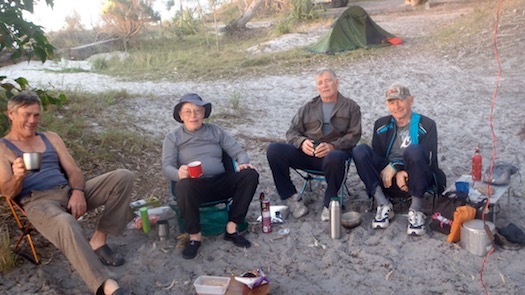 High Tide 1123 hrs – Carlo Point to Teebar Creek (20K) – paddling against the tide to entrance of creek, then tide assistance to morning tea spot. Then against tide to mouth of creek on return run, and tide assistance remainder of the way to Carlo Point. High Tide 1205 hrs – Bullock Point to Kauri Creek (or west coast Fraser Island) (20 K) – paddling against tide until Fraser Island, then incoming tide assistance. On return trip paddling against the tide until channel, then tide assist back to Bullock Point. High Tide 1253 hrs – Carlo Point to Inskip Point (22K) (or possibly Bullock Point across to Fraser Island) – Paddling against tide to Inskip Point (but should be early point of tidal flow), will have tide assist on return journey. A paddle leash is currently only a vessel prerequisite for Grade 2 Waters. However, the committee members recommend that it be fitted to all vessels. A paddle leash is a means of securing your paddle and freeing you hands. They need not be expensive. Check out the equipment used by other members before you part with your cash. Here is a simple unit. It is made from bungee cord and a cord stop, sourced from Whitworths … only cost a few dollars. Distress Signals, Flares and EPIRBS. 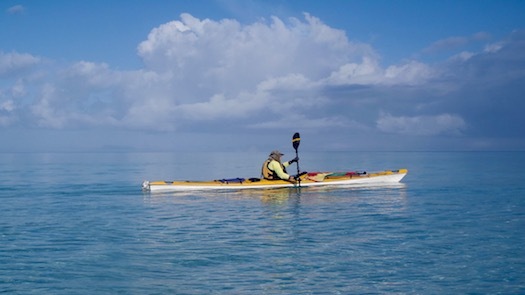 Sea Kayaks are grouped by QLD Maritime Safety as Personal Water Craft – PWC. The Safety Regulations that apply for Distress Signals, Flares and EPIRBS can be found here .. If you attend a Club Event, you will not have to carry an Emergency Beacon! – Our events are held within Smooth or Partially Smooth Waters. However, for those who venture further afield, then read on. What is an Emergency Beacon? This is a small electronic device that, when activated in an emergency, can help search and rescue authorities pinpoint your position. There are two types – EPIRBS and PLBs. An EPIRB is registered to a vessel – in our case our Club. A PLB is carried by an individual. What should a Kayaker carry? When should they be carried? If you are operating beyond the limits of Smooth or Partially Smooth Water or more than 2 Nautical Miles from land. Where should you carry it? On your PFD where it is accessible – Do not carry it inside the hatches on your vessel. Preparation Guidelines for an Extended Trip – George Reeman. George heading for Sandy Cape, Fraser Island. After you have decided where you are going and where you will be camping, check if camping permits are required and if there is water available. Tide times are very important. This may determine when you go. The further north you go the bigger the tides, and the harder it is to paddle against it. Make sure the seat and back rest are comfortable. All hatch covers should fit well, be water tight, and are tied on. Deck lines must be in good condition. A painter, attached to the bow, is excellent if required for mooring. The most common problem on extended trips are rudders. Make sure the rudder is securely attached and the foot pedals operate freely; rudder cables are not worn or frayed. If so, replace them. Check your paddle and leash. Make sure your spray skirt fits the cockpit, it does not leak and can be removed easily in the case of a roll-over. Make sure it is comfortable. Pockets are important to carry other safety items. A large pocket in the back of the PFD to carry a hydration pack is a good idea. This should be carried in a PFD pocket and secured to the PFD. Check if your PLB floats upright when activated. Some do not. The aerial must be upright to send the signal to the satellite. Good for communicating with each other. Select a channel that is not common with local stations to contact each other, switch to dual watch so you can listen to Channel 16, the Emergency channel. On dual watch, Channel 16 will tell you which channel to change to for the weather report. You should also have a direct button to Channel 16 on your radio for emergencies. Notify the local VMR that you are in the area, and for how long, and what channel they use. Also, if you return to that area, don’t forget to cancel the watch with VMR. Hand held VHF radios are only good for about 3kms or line of sight, depending on the power of the set. Remember to make it as easy as possible for a rescue boat or helicopter to find you. A whistle, mirror, flare, day or night space blanket, and sea dye. Any of these are good for attracting attention. A short tether line to secure yourself to the kayak is also a good idea, if you are offshore. The above items should be carried on you, not stored in a hatch. Many very experienced paddlers have lost or almost lost their lives because their safety equipment was stored in a hatch or cockpit. Other equipment to be carried should include:- spare paddle, stored on the deck; emergency tow rope in the throw bag; electric bilge pump, backed up by a hand pump; sponge or bailing bucket. In case of minor damage, it is a good idea to carry a small dry bag containing bits & pieces, such as – small fibreglass repair kit, Dynasteel bog for plugging holes, duct tape, electrical ties, spare cord and a multi-tool. You should always carry a map of the area. GPS is the common means of navigating these days, but a deck mounted compass is always an easy way of checking your heading. There is another device for informing people where you are, called SPOT. This small device acts like a satellite phone. It can be programmed into one or more home computers. If you press the transmit button it will show on the home computer exactly where you are. It also has a help button, if when pressed it will indicate on the home computer that you require help, and they can notify the authorities. There are many small power cells on the market these days that can be charged at home, and used to recharge radios, GPS, mobile phones, and other devices while on a trip. Also small Solar panels. Most items i.e. food, clothing, camping gear, should be carried in dry bags. Always carry 2 days extra food in case you are held up by weather. Other protective items are a hat or cap with back of the neck protection, sunscreen, insect repellant. For carrying water I find a bag with carry strap, containing a 4lt wine bladder, can be hung in a tree for use. Depending on the length of the trip, additional 4lt wine bladders are ideal. They pack in better than 10l water bags. Always pack your water in the bottom of the kayak. A good place to carry water is in front of the rudder pedals. Don’t end up with your kayak bow -heavy when it is packed. Carry straps:- For a loaded kayak, you require 2 carry straps. These can be made from seat belt webbing, with a loop sewn on each end approx 130cm. The straps should be threaded under the deck lines at each end, to prevent slipping off. If you have 6 people, you can use a third strap under the cockpit. This doesn’t need loops. This is useful if you need to carry any distance. The above information is a guide only. End of the Day - Fraser Island. Copyright © 2011 Suncoast Seniors Recreational Kayaking Club Inc.